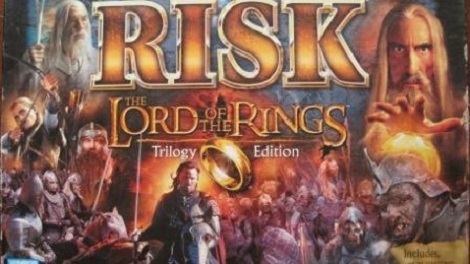 The Risk: Lord of the Rings board game is the best version of Risk there is. Why? Because it’s Risk plus Lord of the Rings. Now, keep in mind that my assertion is completely unbalanced and lacks perspective – I’ve not played many of the Risk variants such as Risk: 2210, Risk: Godstorm, etc. Also, don’t get me wrong, I love classic Risk and will gladly play anytime. Yet, I can’t help but feel that it’s just a world map, uncomplicated strategy, dice-rolling luck, and not much else. It seems that every time I play the game something feels… missing. Recently it was playing a game of Risk: Lord of the Rings (RLOTR) that made me realize what I wanted from the basic version of the game. I want story. Regular Risk has no story. You try and dominate the world but what is your motivation, your history, your reason? As my friend Joe and I played RLOTR with the Lord of the Rings movie trilogy on in the background it dawned on me that I wanted a cause to justify my quest to rule the world (beyond my usual competitive desire to win). I, the forces of Good and Joe, the army of Evil, were two great powers battling for the fate of Middle Earth. 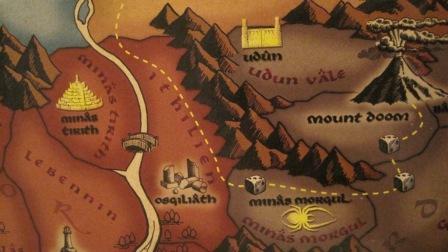 The game’s board is very close to the books’ map of Middle Earth. The rivers and mountains that divide the great land mass are where they should be and create distinct regions perfect for territorial warfare. 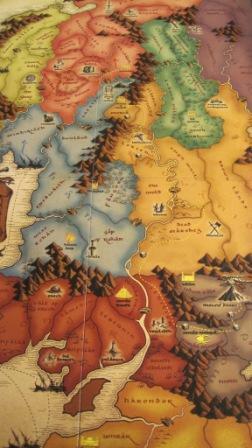 But more, playing a game using Tolkien’s map of his fictional world shows the thoroughness the writer took in creating it. Quite often epic showdowns happen in the same places they did in the books and a healthy knowledge of that universe comes in handy. For example, controlling the Mines of Moria can be very important as it’s the bridge across a large mountain range and the only way around those mountains is conquering territory far north or far south through the lands of Rohan. Or as my last game proved, if one player controls Mordor and another controls the lands of Gondor, they’re in for a prolonged conflict. With my large army at Minas Tirith and Joe’s equally large force spilling out of Mordor, Osgiliath changed hands many times (sound familiar?). It wasn’t until Joe outflanked me by sea that the stalemate broke and the forces of evil eventually triumphed; something I should have seen coming. In the books that exact maneuver was thwarted by Aragorn leading an undead army to stop Mordor’s naval attack. In my defense I had forgotten about sea attacks by that point since Joe and I had finished a bottle of Makers Mark. I do want to note that I play RLOTR using regular Risk’s rules about setup and play while throwing in a few of the special edition’s extra rules. There are actually a few more rules for RLOTR that we completely ignored. For instance, there’s a “ring track” that the One Ring follows and could potentially end the game prematurely. This mechanic serves to give players some focus to their play, and to keep the game from lasting forever—a real problem in standard sessions of Risk. But if only two people are playing from the start, then that’s not so much of a problem. Mainly we utilize the RLOTR rules that give small bonuses here and there but that don’t affect things too dramatically. Admittedly much of the story that Risk: Lord of the Rings creates is inferred from my love of the Lord of the Rings books and movies. It’s still a fairly simple board game where success and failure are ruled by dice. Knowing the books in and out and having the movies on in the background helps fuel my imagination while playing – even though it makes my girlfriend shake her head in bemusement and quickly leave the room. I realized that some semblance of a story or some sort of motivation was what I was looking for in a game of Risk and I found that in Risk: Lord of the Rings. If you’re going to play me you’d better read up on your Tolkien first. You are a geek, but so am I. This is why we are friends. At some point there will be a lazy weekend in which I will request that we try this game. Because I was raised on Risk. But I’ll go read a little more Tolkien first.